Mount Pleasant Granary - Comments - Saturday 15th. November, 2014 – They really can’t stay away! Monday 6th. April, 2015 – Holiday Monday. This is a picture of the Bothy at the stage we have now reached. 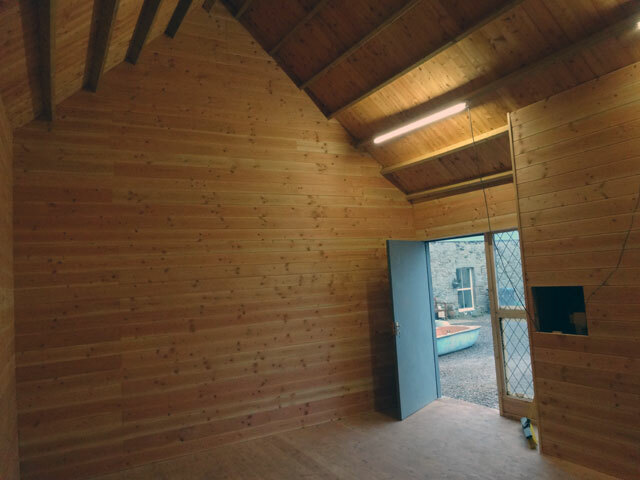 The building work has been completed and the inside looks like a giant garden shed – but just wait until it has all been fitted out: it is going to look like a pine palace! Slept in until half-past nine and then walked Mix and set about my morning’s work of cleaning out and cleaning up the Bothy. During the morning both Tom and David arrived – I think that they are both rightly proud of all that we have achieved and, like me, are looking forward to the next tasks, the fitting of lights, carpets, furniture and so on. (We won’t fit shingles on the roof until the warmth of the summer next year). I got everything looking good (carrying wood and tools up to the next site of work – upstairs in the Hen House – and cleaning out the Bothy) and then had a snack lunch in the summer house, where I also spent the rest of the afternoon, catching up with tasks which were waiting to be done (not least this blog and my finances). Rachel is enjoying sorting out the music for the Gavinton Service tomorrow. We all dined together at six, after which Rachel and I enjoyed a quiet evening in front of the fire watching an episode of Montalbano. What a lovely life we have.